75 year old Nigerian president, Muhammadu Buhari, has finally put pen to paper in a bill that seeks to lower the age limit of political office holders to enter into roles – thus inspiring a movement of young politicians to lead the country forward. This move comes not only as positive news at home, but has also given hope to millions of youths across Africa who have struggled to enter into political offices as they wedge their way through the dominant old boys‘ political networks. 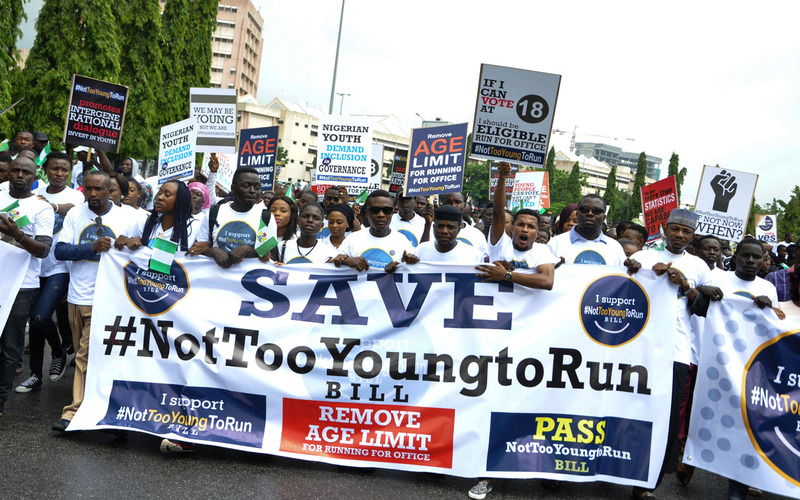 The bill was signed alongside an affirmative and widespread campaign dubbed, ‘Not too young to run’. It mobilised youths to agitate for political reforms in Africa’s most populous country. The bill now seeks to reduce the minimum age for Presidential candidates to 35 from 40 years old, for Governors and Senators from 35 to 30 and State Assembly Members to 25. This is a landmark move for Nigeria, a country that has the highest population of youths in the continent. This new development hopes to inspire a revolution across a continent that has some of the oldest serving Presidents; politicians who have hung on to power at any cost. So far, only six countries have a similar age limit for voting and seeking elective office, those include South Africa, Swaziland, Uganda, Mozambique Guinea and Kenya. Although 51 percent of the global population is below 30 years old, only a paltry 2 percent of lawmakers are under 30. In Africa, this represents just 1.2 percent. Yet numerous polls and studies show that the public supports inclusion of youth in the political process in order to champion and shape its agenda. With the youth being the majority population in all African countries, it only makes sense to have them in political office positions, formulating policies that are in tune with their generation’s dreams. It is, however, a tough journey for the young people trying to make a stab at politics: lack of financial muscle to carry out campaigns and fierce competition from established networks means the playing field is not levelled for them from the get go. No country can ever grow if it doesn’t put the interests of its young people, who hold its future in their hands, at the foreground. The youth of Africa knows this and are ready to fight for their space at whatever cost. The ‘not so young to run’ campaign just proved it.